Profil Germany’s range of clinical methods are unrivalled in the industry. 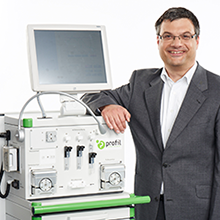 Profil has vast experience with a wide range of sophisticated investigational methods and techniques for clinical trials on diabetes, prediabetes and obesity. Whether you are performing studies on new or modified medications, medical devices, insulin alternatives or treatment regimes, Profil can support you. ClampArt is Profil’s novel, proprietary, fully automated glucose clamp device, already well known in clinical diabetes investigations. Our experts work with the full range of glucose clamp settings. For example, we can assess the pharmacokinetics and pharmacodynamics of blood glucose-lowering agents, determine insulin sensitivity, investigate endogenous glucose production using the stable isotope dilution technique, and study β-cell function. We also perform micro- and macrovascular evaluations of endothelial function using a range of techniques, including the laser Doppler method, flow-mediated dilation (FMD) and tonometry. Other aspects important for antidiabetic compounds can be investigated, including assessments of body composition (using BOD POD), energy expenditure (via indirect calorimetry), food intake (using computerized buffet), metabolic fluxes (via tracer techniques) and adipose and muscle tissue biopsies. Naturally, all of the methods needed for safety assessments, including telemetry and spirometry are also available. Click on the links below to read more about the methods we offer for your clinical trials or see a list of other methods. Discover the development and application of ClampArt. Body composition measurements at Profil. Rely on Profil flow-mediated dilation measurements. Read about transient elastography with continued attenuation parameter. Read about the theory and practice of retinal laser scanning. See how Profil Germany applies laser Doppler assessment in quantifying microvascular blood flow. Discover the theory behind indirect calorimetry, spiroergometry and the doubly labeled water method. See the important role of stable isotope studies in diabetes research. Find out what biopsy services Profil offers. The methods offered at the Profil Institute for Metabolic Research for clinical investigations of diabetes, prediabetes and obesity treatments include: using ClampArt or other automated glucose clamp devices for pharmacokinetics and pharmacodynamics studies; using the laser Doppler method, flow-mediated dilation (FMD) and tonometry for micro- and macrovascular evaluations of endothelial function; assessments of body composition (using BOD POD), energy expenditure (via indirect calorimetry), food intake (using computerized buffet), metabolic fluxes (via tracer techniques) and adipose and muscle tissue biopsies; and safety assessments using telemetry and spirometry.